Youth unemployment is one of society’s greatest challenges and missed opportunities. As youth joblessness hits dizzying levels around the globe, the unbridled energy, enthusiasm and new ideas of the young are going to waste. Society, governments, employers, educators and students all have an urgent need to transform workforce development and help ensure the world’s young can look forward to promising economic opportunities, find work and build productive, fulfilling careers. From the Middle East to Japan, the lack of work and sense of hopelessness felt by the young have been credited with igniting the Arab Spring, social unrest and abject discontent around the world. Youth who are fortunate enough to get degrees but not jobs feel their countries have failed them by not living up to the implicit social promise that hard work and education are supposed to lead to a prosperous future. An ever-growing slate of concerning headlines tells the story of the global scourge youth unemployment has become: “Generation Jobless” in The Economist, “For London Young, Down and Out is a Way of Life” by Landon Thomas in The New York Times, “Relentlessly High Youth Unemployment is a Global Time Bomb” by John Podesta in The Guardian, and “Europe’s Record Youth Unemployment: The Scariest Graph in the World Just Got Scarier,” by Derek Thompson in The Atlantic. Reproduced below, the morbidly intriguing Scariest Graph in the World was originally provided by James Plunkett, Director of Policy at Resolution Foundation in London. Across the European Union, more than 5.6 million people under age 25 could not find work as of May. In Greece, at least 62.5 percent of those under 25 who wanted a job could not get one. In Spain and Italy, the corresponding figures exceeded 56 percent and 40 percent, respectively. High youth unemployment is a persistent problem in France, where youth joblessness has reportedly hovered around 25 percent for 30 years. This lack of opportunity, combined with what some view as a long-standing state of national decline, led Felix Marquardt to pen a recent opinion piece for The New York Times titled, “The Best Hope for France’s Young? Get Out.” Creating jobs for young people who want to work could go a long ways toward helping France deal with its other socially explosive labor issue of raising the minimum retirement age. While the U.S. economy has fared better than most European markets, America has hardly escaped the youth unemployment challenge. 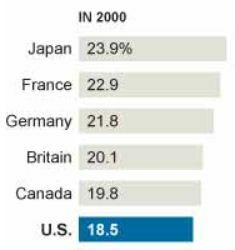 From 2000 to 2011, the U.S. moved from having the lowest non-employment rate among the world’s large, wealthy countries at 18.5 percent to the highest at 26.6 percent. 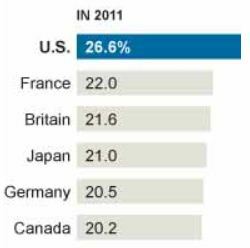 The charts below from The New York Times show the U.S. youth non-employment rate exceeding those of Canada, France, Germany, Japan and the U.K. by at least 4.6 percentage points, translating to 20 percent more Americans not in the workforce. 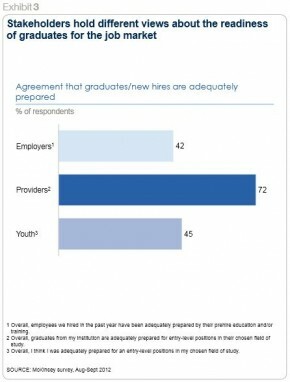 Large U.S. companies’ disconcerting reluctance to open their doors to more workers has not helped address the problem of high youth unemployment. Despite higher productivity, coffers full of cash and a glut of young prospects, the prevailing tide of global economic uncertainty has left them loathe to expand their ranks, not knowing when or where the next economic bombshell may fall. Where youth are able to find jobs, they are often under-employed, overworked, underpaid and subjected to poor work cultures and conditions. In Japan, many youth who lack alternatives find their way to so-called “black companies” that ruthlessly exploit young workers for their own gain. A leading Japanese daily The Asahi Shimbun describes a black company as one that, “harasses employees, forces them to work long hours often without pay, and presses them to resign.” Firsthand accounts of Japanese workers who have endured the black company experience can be heard in the documentary by Japanese director Tokachi Tsuchiya, “Black Kigyo ni Go-Yojin” (Beware of Black Corporations). The BRIC Countries of Brazil, India and China have also felt the economic and social sting of discontented youth and too few skilled workers. Even in relatively booming China, young Chinese have been known to sit at home for years waiting for openings in office jobs. In the meantime, even high-tech manufacturing positions, which initially pay as much as three times more than office jobs, go unfilled due to a shortage of skilled applicants and a stigma against factory work. It seems even young graduates with questionable educational pedigrees in majors like office design and tradeshow planning refuse to so much as entertain temporary stints at high-paying factory jobs. Recent protests in Brazil and elsewhere reflect the consequences of a shortage of economic opportunities for the nation’s young people. In Brazil, youth unemployment has exceeded 20 percent and reached levels as high as 52 percent in the country’s Northeast region according to data from USAID. Germany is a rare exception to the global trend of high youth unemployment. With its robust economy a rare bright spot in Europe’s broader economic malaise, the Teutonic juggernaut finds itself faced with having to look beyond its own borders to locate enough skilled workers. As explored further below, part of Germany’s success owes to its pragmatic educational system that emphasizes vocational training and company apprenticeships. On the other hand, not even Germany has escaped unscathed by the sacrifices exacted by the modern economy. In a special report on Germany titled “The Reluctant Hegemon,” a thorough analysis by The Economist’s Zanny Minton Beddoes exposes stagnating wages, income inequality and “huge” wealth disparities. The global economic downturn has done no favors for people of any age looking for work or hoping to embark on a new career. Nevertheless, despite the global economy’s prominent role in the shortage of employment opportunities around the world, there is more to the story. From the U.S. and Japan to the BRIC countries of Brazil, India and China, employment and economic development are hindered by a wide gap between the skills that employers need and the young have to offer. In Japan, 85 percent of employers reported having difficulty finding the talent to fill jobs in ManpowerGroup’s Talent Shortage Survey 2013. The next highest figures were reported by employers in Brazil and India, where 68 percent and 61 percent, respectively, of respondents reported difficulty filling jobs. A study by McKinsey warns China could forgo $250 billion – or 2.3% of GDP in 2020 – by failing to bridge the gap in its supply and demand for high-skilled labor. An enlightening report by McKinsey’s Social Sector practice titled “Education to Employment: Designing a System that Works” helps to shed some light on this gap in the supply and demand for skilled labor. The report analyzes the causes and costs of unemployment and unfilled jobs in nine developed and developing countries, including Brazil, Germany, India, Mexico, Morocco, Turkey, Saudi Arabia, the U.K. and the U.S.
Schools and employers that fare best in workforce development and job placement engage students and one another “early and intensely” throughout the education and training journey. They work together to design curricula, invite workers into the classroom as teachers and counselors, enable students to gain on-the-job experience and secure hiring guarantees before programs even begin. While potentially more applicable in some cases than others, Germany’s vocational training and apprenticeship model can offer some valuable lessons. Under a new agreement with Spain, Germany will help its southern European counterpart build a “dual-track vocational system” where young people will develop skills and earn employment qualifications by combining work and study. Companies also have an important role to play in providing training and education to expand the skills and opportunities of their current employees. Gap’s P.A.C.E. (short for Professional Advancement & Career Enhancement) program provides job and basic life skills, technical training and educational learning to female garment workers in developing countries in Asia. Through collaboration with international partners and the support of its Commitments to Action with the Clinton Global Initiative, the program has so far provided 65-80 hours of education and training to 17,000 women in seven countries. One of the best resources for training and workforce development are the employees who already have the skills and knowledge that employers are looking to fill. Through employee engagement programs, employees can share their expertise and experience with the next generation of aspiring job candidates. Enlightened, forward-thinking companies understand that mentoring and training programs can be valuable tools for improving employee satisfaction and retention. The best-designed programs help employees develop new skills that enable them to perform better at their jobs and expand their own horizons while enjoying the satisfaction of helping others. Among employers’ greatest needs are workers with the technical skills needed to succeed at jobs in information communication technology (ICT), high-tech manufacturing, medicine, green sectors like renewable energy and other growing, 21st century industries. With this in mind, the U.S. government and private sector have thrown their support behind STEM education programs designed to develop workforce skills in science, technology, engineering and math. President Obama announced the goal to add 100,000 new STEM teachers over 10 years during his 2011 State of the Union address. Eliminating obstacles could play a key role in increasing STEM training and graduates. A recent Bloomberg article titled “Why U.S. Students Don’t Major in Science” by Cass Sunstein, the Robert Walmsley Professor at Harvard Law School, points to some interesting findings from the father-son academic duo Todd and Ralph Stinebrickner. In the Stinebrickners’ study, while 19.8 percent of students thought they would major in science upon entering college, only 7.4 percent ended up doing so. No other major showed anywhere near this degree of disparity. While the study’s broader applicability has yet to be tested and there could be many legitimate reasons why students might choose to abandon science at higher rates, the implications are instructive nonetheless. Educators and companies have an important role to play in keeping students interested in science and STEM careers by designing positive, engaging education experiences and identifying employment opportunities in STEM fields. Fortunately, prominent corporate proponents of STEM education include some of the world’s biggest technology and energy companies. In India, leading technology companies behind the countries’ IT outsourcing movement like Wipro and Infosys are doing their part to ensure workers have the technological skills their businesses and economic growth demand. More would do well to follow their good example. In reality, many students, especially outside of the world’s wealthiest economies, will not have the opportunity to attend a four-year college. Youth from poorer developing countries and marginalized populations will be lucky to complete secondary education or even far less in some cases. In too many places, girls and young women are still likely to be denied many of the educational benefits that go to their young male relatives and peers. In India and other developing countries, formal employment is still a luxury enjoyed by only a select sliver of the population. Most have no choice but to fend for themselves and seek work wherever they can find it as what some have called “reluctant entrepreneurs.” When they do, they are likely to be rewarded with earnings of just a few dollars per day. In all, more than 90 percent of Indians work outside the formal sector in the unregulated informal economy. Fortunately, a number of ambitious organizations in India and other developing countries are helping to supply practical training and work opportunities to poor, marginalized populations who live on $5 per day or less at the so-called base of the pyramid. Through its Commitments to Action with the Clinton Global Initiative, the Drishtee Foundation has provided training and developed new livelihoods for thousands of micro-entrepreneurs in rural India. Another Indian non-profit, LabourNet, offers practical classroom-based training in basic skills to people in the informal sector and connects them with opportunities to work. The additional income many participants earn through their new skills can be instrumental in lifting poor Indian families out of a life of extreme poverty. Pratham, India’s largest non-governmental education organization, provides training programs to help students learn marketable skills in industries such as agriculture, hospitality and banking. Pratham and LabourNet have also managed to successfully partner with large domestic and multinational companies like Godrej, Taj Hotels, Schneider Electric and Deutsche Bank to expand avenues to employment in the formal sector. The rapidly evolving landscape of digital technology provides a powerful new platform for improving workforce development in at least three ways: 1) as a medium that expands access to education and training; 2) as a tool for improving the quality and relevance of education and training; and 3) as a growing field with high-quality job prospects, particularly in developing countries. Many of the world’s leading universities – including the likes of Stanford and MIT – have embraced massively open online courses (MOOCs) as powerful new formats for introducing new curricula and reaching distant and marginalized learners. In developing countries in Africa and elsewhere, simple SMS text messaging with information on farming techniques and market prices have significantly increased crop yields and earnings. The tech stalwart Cisco has established 10,000 Networking Academies in 165 countries to help students develop ICT skills and fill the ample global demand for networking professionals. Current and future generations of young people deserve better than the world is offering them today. As studies by McKinsey and others demonstrate, the roles of educators and employers in linking education and training to promising employment opportunities needs a fundamental overhauling. Fortunately, this transformation seems to have something in it for everyone. While neither cheap nor easy, the reinvention of the path from education to employment is hardly an option and well worth the investment. New approaches to deep, continuous collaboration will help educators and students develop the skills that employers demand and students need to find work and look forward to a brighter future for all. Along the way, educators and companies in wealthy economies may do well to study and borrow a page from some of the innovative initiatives in developing countries and emerging markets.